Shiitake mushrooms have a delicious rich flavour and remarkably rich in antioxidants. This mushrooms help cleanse the blood, and are useful in the treatment of arteriosclerosis and high blood pressure, also they reduce cholesterol and strengthen the immune system. It’s understandable why they have been used in Chinese medicine for over 6000 years. This is an easy healthy snack recipe. Enjoy full flavour of shiitake mushrooms and the full health benefits. Remove the shiitake mushroom steams. Mix the finely chopped dill, the cheddar cheese, the mayonnaise in a small bowl. Upside down the mushrooms and put the cheese mixture onto the mushroom caps. Grill under a medium heat about 5 minutes until the cheese is bubbling and melted. Sprinkle with some black pepper and serve. This is a super simple sushi dish. All the ingredients are easy to find at a supermarket and just cut them into small pieces and mix with sushi rice. Smoke salmon and cheddar cheese go very well with sushi rice, actually these ingredients are often used for ‘Western-style sushi’ in Japan. It doesn’t take time and effort to make. To make sushi rice, please see the previous post. 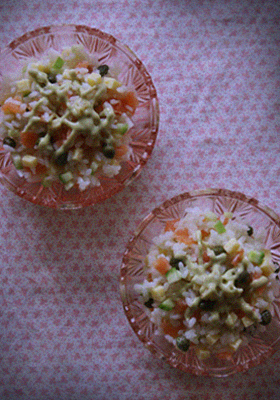 Cut the cucumber, the smoke salmon and cheddar cheese into small peaces and mix with the sushi rice. To make wasabi sauce, mix the wasabi paste, the soya sauce and the mayonnaise in a small bowl. Sprinkle the cappers on the sushi rice. Serves with the wasabi sauce or a dash of soya sauce. Sushi is the most famous and popular Japanese dish in the West. But it’s not popular to cook sushi at home. 1. Don’t know how to cook sushi rice. 2. A bit scary to deal with raw fish. 3. Can’t be bothered to roll up rice. OK, here is the solution; Box Sushi. Ta-dah! 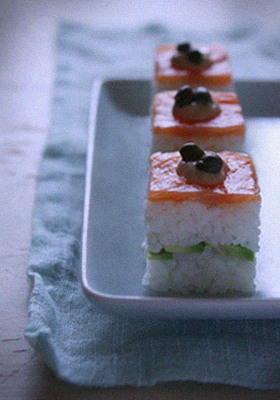 You can make this pretty sushi without special technics. It just needs a box, a chocolate box or a biscuit box or any kind of box. And then place ingredients in the box, press them and cut like mini cakes. This is a great home party dish. To make sushi rice, rinse the rice in a clod water, changing the water several times until the water runs almost clear. Pour 500ml water in the pan and cover with tight-fitting rid. Bring to the boil over high heat and let cook for 2 minutes. Reduce the heat to the lowest and simmer (always cover the pan with a rid) 15 minutes. Transfer the cooked rice into a large bowl. Mix the rice vinegar, sugar and salt in a small bowl, and sprinkle evenly over the rice, mix the vinegar mixture and rice (do not mush when you mix the rice). To make soya sauce cream sauce, mix the soya sauce and mayonnaise in a small bowl. Lay the smoked salmon slices on the bottom of the box. Spread half sushi rice on top of the salmon, press the rice with fingers (the rice is sticky, you need to wet you hands). 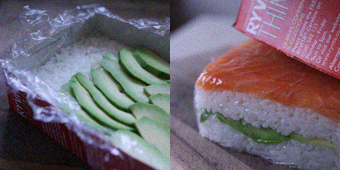 Lay the thinly sliced avocado on the sushi rice and spread the remaining sushi rice on it, press the rice with fingers. Cover the top of rice with cling film and place a hard board (cut to fit inside of the box), and put a weight (book or something) on the board and leave it 1-2 hours. When serving, turn the box and carefully remove the sushi out onto a chopping board and cut into square blocks with a wet knife. Garnish with the soya sauce cream sauce and cappers. A morning after the rain. That remind me mushroom hunting. I was often forced to go to a mushroom mountain by my dad when I was teenager (I was born in the country side of Japan). I hated mushroom hunting because I didn’t like to get my clothes dirty and I was really fed up with mushroom dishes everyday after the hunting. But I’m sure now I can enjoy to go to the mushroom mountain and fill up a big bag with full of mushrooms and to be pleased with full-course mushroom meals. Well, I was obsessed with mushrooms this morning, and I decided to cook a mushroom dish for lunch. The combination of garlic, butter and soya sauce makes beautiful taste. And I really enjoyed this mushrooms dish. But, the best mushroom dish I’ve ever had was that dish after the muddy mushroom hunting. Cook the rice in a large pot of boiling water until cooked (follow the package directions). Drain and allow to cool (or use leftover trice straight from a fridge). Heat the butter in a frying-pan over medium-high heat, stir fry the oyster mushrooms and finely chopped garlic. 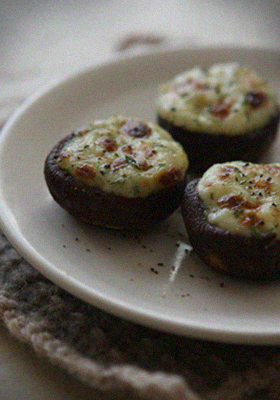 Pour the white wine evenly over the mushrooms and season with the salt and pepper. Add the cooked rice into the pan, stir fry about 2 minutes and sprinkle with soy sauce, then sir fry a bit more. 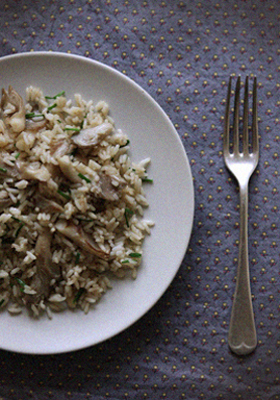 Turn off the heat , add the chopped chives into the pan and mix. When I was a child, my mum told me ‘Eat tofu, if you want to have soft smooth skin like tofu’. So, that’s one of the reason why I keep eating tofu (of course I like the taste too!). Tofu is made from soya beans, it obviously has many of the nutritional benefits; low-calorie, high protein, rich in vitamin B and cholesterol-free etc. Also it helps further absorption of vitamin E which is a very important vitamin for antioxidant and smooth skin. 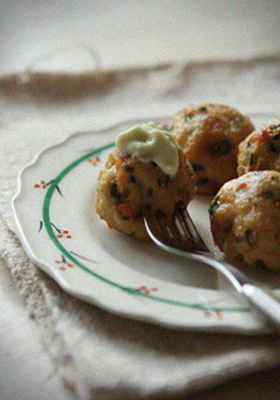 This tofu balls have nice fluffy texture and perfect for a snack. I ate it a lot this afternoon, and wishing my skin is becoming like tofu. Wrap the tofu in a clean tea towel or some layer of kitchen papers, and place a heavy thing (such as a pan) on top of it to force out excess water, then leave it for about 20 minutes. Put the drained tofu in a bowl and mash. Add the corn flour, beaten egg, soya sauce and a pinch of salt and pepper. Mix them well. Chop the carrot, fine beans and chives finely and add them into the tofu mixture and mix all together. Roll the tofu mixture into small balls. Heat the oil to 170C/340F and deep-fry the tofu balls until golden brown. Drain on kitchen paper. To make the wasabi dip, place the wasabi paste, sour cream and lemon juice and mix well. adjust the seasoning with a touch of salt. Serve the tofu balls with the wasabi dip (or any kind of your favourite dip for chips). 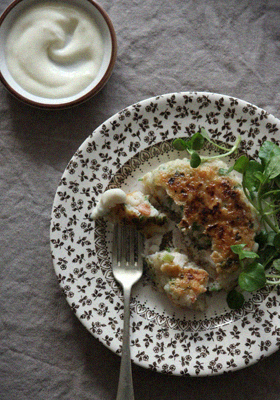 This is an easy, low-fat prawn cake. Just mix everything together, pan-frying and ready. It isn’t used mashed potatoes or eggs as a binder. Great for a big prawn fan like me. Coarsely chop the peeled raw prawn. Place all the ingredients (prawn, spring onion, ginger, flower, corn flower, white wine, salt and paper) in a medium bowl and mix well with a hand. Heat some oil in a frying-pan on a medium heat. Wet your hands with water and shape the mixture into 2 balls. Put the mixture balls on a frying-pan and flatten each ball to make round flat cakes. Pan-fry for 3 minutes on each side, letting them get golden and cooked through. Mix well all the ingredients of Lemon yogurt dip in a small bowl. You are currently browsing the Japanese Fusion category at Fish Trip Cafe.